Children who are enthusiastic about swimming and want to take their swimming skills to the next level are encouraged to join Azionaqua’s swim team. Team members learn about competitive swimming in a fun, recreational environment. Team members receive instruction on all four strokes and have the opportunity to compete against area swim teams. Click here to register online now to join the Azionaqua Swim Team. Evaluations for new members will be held Wednesday, 5/29 between 4:30-6 pm. The head coach, Paul Magoni, got involved in swimming when he was six years old and actively participated in swimming until he was 19. 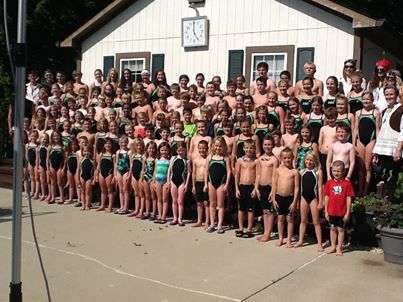 He has been a swim coach for the Zionsville Swim Club working with swimmers ranging from age 6 to 12 years old. Paul attended Indiana University and received a bachelor’s degree in Political Science and History. Recently, he went back to school at Marian College and received a teaching endorsement and is currently teaching at the Zionsville Community High School. Swimmers must be under the age of 15 as of June 1, 2019. Azionaqua membership is not required to join the swim team. Only new swimmers to the team need to participate in a swim evaluation. Fee per swimmer: $145 for Azionaqua members, $275 for non-members. Fee includes coaching, practice time, meet, conference fees, year-end party and awards. Swimmers sign-up for swim meets in which they wish to participate. Each swimmer will swim in at least two events per meet. Swim practice begins Monday, June 3 & will be held Monday through Friday. Please arrive 10 minutes early for stretching. Age 8 and under practice 9:45 a.m. – 10:30 a.m.
Age 9-12 practice 8:30 a.m. – 9:30 a.m.
Age 13-14 practice 8:30 a.m. – 9:45 a.m.
We do practice the morning of meets. We practice rain or shine Monday through Friday. If there is thunder or lightning, we will keep the swimmers out of the water for the appropriate time and then finish practice. If you feel the weather is too poor for your swimmer to take part in practice, please feel free to keep your swimmer at home for the day. **There will be no practice on July 4th, but we will have practice the rest of the week. We swim in the Northside Swim Conference. All swimmers are to sign up for meets no later than after practice the day before the meet. We will use Sign-up Genius to sign-up swimmers for meets. There will be a link to the Sign-up Genius attached to a weekly newsletter from Coach Paul. Swimmers need to be at the pool by 4:45 to attend warm-up and to allow the meet to begin at 5:30. All swimmers need to stay in the designated swimmer area during the meet to ensure that they get to their proper events. Parents are asked to stay out of the swimmers’ area during the meet. Swimmers are to bring everything that they will need for the meet at the start of the meet so they can remain in the designated swimmer area. Each swimmer will swim at least 2 individual events with a maximum of 3 and at least one relay. It is important that swimmers who are involved in relays stay to the end of the meet. Otherwise a relay team may not get to swim. All parents volunteer for at least 2 meets during the swim season. If you are unable to meet the volunteer requirements, you will be assessed a $100 fee. If your swimmer ages up during the swim season, eligibility is based on age as of June 1. For example, if your child is 8 on June 10, but turns 9 on June 11, the child will be an 8 and under the entire swim season. If your question was not addressed or if further clarification is needed for a concern, please feel free to contact Paul Magoni (Head Swim Coach) at pmagoni@zcs.k12.in.us or 317-514-5977.